For years, industrial companies have been working to boost cost efficiency and make their operations more economical by pursuing the established principles of lean production and continuous improvement for internal processes. Over this time, more has evolved than just the basic principles. Even the ideas of the continuous improvement process can be put into action much more efficiently using state-of-the-art lean production building kit systems. The compact guide takes you from the origins of lean production to the continuous improvement process and the role of the lean production building kit system. Seven highly effective principles have become established as a cost-effective and sustainable means of tackling waste in production. State-of-the-art lean production building kit systems halve the time and number of employees needed to engineer transport trolleys and other production equipment. Find out more about the key factors when building efficient factory equipment that will help you put lean principles into practice with minimal planning and assembly outlay. 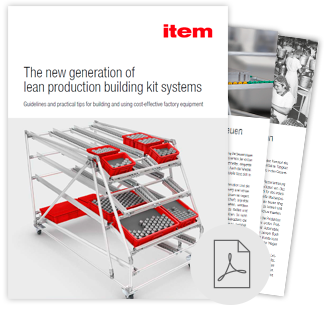 Only a continuously evolving building kit system for factory equipment that is based firmly on the principles of lean production will give you all the options needed to achieve optimum production efficiency and stay competitive for the long term. Simply complete the form to get immediate access to the free practical guide in PDF format.